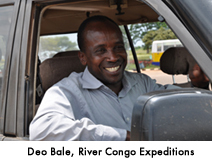 River Congo Expeditions offers competitive tours, safaris & expeditions in Africa! Our Africa expeditions will bring you through Congo, Rwanda & Uganda. WELCOME TO RIVER CONGO EXPEDITIONS! With a lifetime experience in Africa, and in particular in the Democratic Republic Congo, River Congo Expeditions offers the most competitive Tours and Safaris packages to this beautiful country with a wealth of attractions. Experience the Mountain- & Lowland Gorillas. See the Mountains with one of the most active volcanoes in Africa. Or visit Goma, the marvelous town on the shores of lake Kivu. How about visiting the the forgotten Mbuti tribe (pygmies) in Ituri Forest, Congo? Or look for the Okapis (Okapia Johnosonii) in Epulu sanctuary? We are also experts in travels to Uganda (The Pearl of Africa) and Rwanda. Uganda, with its Queen Elizabeth NP, the Murchison Falls and Kibale Forest Nationals Park (chimpansees). Rwanda with Parc National des Volcans (Mountain Gorillas, Golden Monkeys). Whatever travel you wish to do: we welcome you to discover all the wonders in these beautiful countries.